Our Community Forests project aims to establish a successful model of community-based forest management, one that focuses on the rights, needs and priorities of local communities, including those of marginalised groups such as indigenous peoples and women. The project’s overall aim is to alleviate poverty, improve rural livelihoods and reduce deforestation in the Congo Basin. To date, the forest sector in Africa’s Congo Basin has strongly favoured large-scale land allocations over community-based forest management. However, over time this large-scale model has generated little to no substantive evidence of significant developmental or environmental benefit to local communities. There is a growing consensus that strengthening forest communities’ rights is an effective means of both protecting rainforests and fighting poverty. In February 2016, the Democratic Republic of Congo (DRC) passed community forest legislation in what is arguably the most ground-breaking legal development related to Congo Basin rainforests in recent years. The DRC is home to the second largest and most intact area of contiguous rainforest in the world, and now over 75 million hectares of forest (three times the size of the UK) could be available to local communities, who can manage their natural resources according to their own customs and needs. The project, which is funded by the UK Department for International Development (DfID), is testing community forestry in DRC, applying lessons learnt from previous approaches pioneered in forested regions both within Africa and globally. The Community Forests project works at local, provincial and national levels. At the local level, we’re working directly with communities to set up pilot sites. 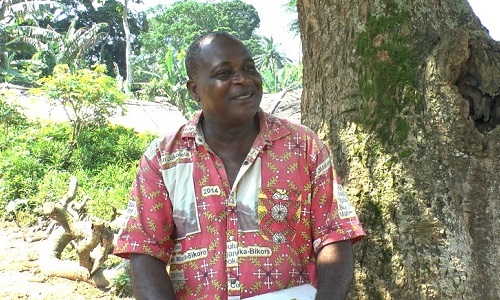 At the provincial and national levels, we’re working to strengthen administrative capacity and to build consensus between government, civil society, donors and other relevant stakeholders through a gradual and controlled approach to community forestry in DRC.
" For a long time, we’ve seen loggers come here. It was not good. We only knew that the State had sold the forest, and the loggers kept coming… Then you [RFUK and local partner GASHE] came to support us in obtaining our community forest. Our hope is that we reach the end of this process so that the forest belongs to us and we can manage it how we wish… "
" What I like most (about my work with local communities) is the gender aspect… ‘Gender mainstreaming’ means that there will be women's involvement throughout. Women are not only central to family life, but they also have an important role to play in the use of forest resources… "
" There are lots of hippos on our land. I hope that community forestry will help us better protect them. Perhaps we could start doing eco-tourism, or invite scientists to come and study them. "